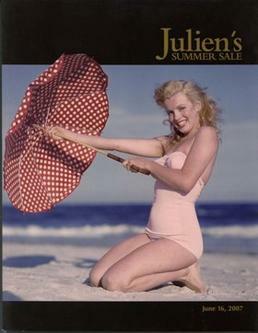 Julien's Auctions 2007 Summer Entertainment Sale will feature rare Memorabilia From Marilyn Monroe, Clark Gable, Elvis Presley, Yoko Ono, John Wayne, James Dean, King Kong, Wizard Of Oz, Cher, Prince,and others. The auction includes an original watercolor hand painted by Marilyn Monroe. It is described in the catalog as follows: “Black ink sketch on rough tooth paper, depicting a cat. Written beneath the image is "a cat watching its own tail move". It is said to come from the personal files of Lotte Goslar, Marilyn's friend and teacher. The estimated selling price is $20,000 - $30,000. The auction will take place Saturday June 16, 2007. In 2005 an original Marilyn Monroe painting sold at auction for $78,000. 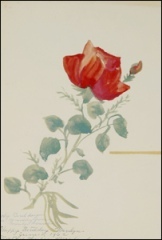 That piece, shown here, was an original watercolor on paper composition featuring a single red rose. It was inscribed to President John F. Kennedy, "Happy Birthday Pres. Kennedy from Marilyn Monroe." See the Pop Life Art home page for links to the work of more than 100 celebrities that create fine art paintings, drawings and photographs.